The competition to create the university’s next $1 million idea now includes a faculty and staff category. The Innovation Task Force launched a second track of its $1 Million Ideas Competition on Monday, introducing a faculty/staff contest to complement the existing Student Scholarship Competition. Both categories invite members of the university community to pitch ideas that will reduce costs or generate revenue of $1 million or more per year for GW. Established by George Washington University President Steven Knapp in 2009, ITF brings students, faculty and staff together to improve GW’s business processes and advance academic priorities. 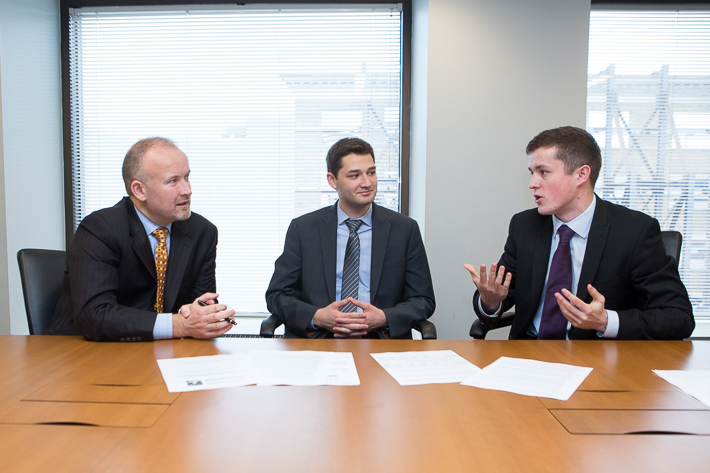 Like the Student Scholarship Competition, won last year by School of Business junior Joe Holleran and second-year Law School student Alex Schneider, the Faculty Staff Ideas Competition involves a series of judging rounds before winners are announced in the spring. The faculty/staff competition involves a prize of $3,000 or free campus parking for a year. The student competition again comes with a prize of a $50,000 scholarship. The idea submission deadline for both the student and faculty/staff categories is Oct. 24. Information sessions for both tracks begin Sept. 16 at the Marvin Center. “The idea is largely to clone and go and keep the process the same,” Mr. Lawlor said. “For the university, the best ideas for new revenue, fundraising, research, savings, whatever the category, often come from the folks who are, on a day-to-day basis, running GW. These are the people who are our greatest assets. Students Alex Schneider, center, and Joe Holleran, right, went through a rigorous competition last year en route to becoming the first winners of the Innovation Task Force Student Scholarship. An expansion of the contest to include faculty and staff is a way to boost momentum for ITF, said Dave Lawlor, left. "We hope this will generate more interest for people to put their ideas into a business proposal that ultimately will lead to a prize for them and a plan for us in the end," he said. Forty-seven ideas were submitted during last year’s inaugural ITF student scholarship competition. More than 65 initiatives have emerged from ITF, ranging from new online programs to implementing cloud data systems. Last spring’s scholarship competition winners, Mr. Schneider and Mr. Holleran, proposed ideas for computer energy savings and international payment solutions, respectively. The payment solutions idea, a cost-savings plan for students based on foreign exchange rate, has been implemented by the university. The energy proposal is in the planning phase within the Division of Operations, Mr. Lawlor said. Both contest tracks are modeled after the GW Business Plan Competition. After the initial submission of a one-page document outlining each idea, a group of proposals will be selected to advance to a second round, where contestants, with help from mentors, will develop an eight- to 12-page business plan. Four to eight finalists will then lead 15-minute presentations in front of senior executives and leaders at GW. Final presentations for the faculty/staff category are scheduled for March 13 and 15. The student finalists present March 19 and 20.